He achieved personal victories before he led his team to victory. Pray for guidance and give thanks for your blessings everyday. Promise to think only the best, to work only for the best, and to expect only the best from yourself and others. "Good coaching is based purely in leadership... a positive example... and instilling respect in your players." "Knowledge is not enough to get desired results. You must have the more elusive ability to teach and to motivate. This defines a leader; if you can't teach and you can't motivate, you can't lead." "You must have respect, which is a part of love, for those under your supervision. Then they will do what you ask and more." "Motivating through fear may work in the short term to get people to do something, but over the long run I believe personal pride is a much greater motivator. It produces far better results that last for a much longer time." "Young people need models, not critics." "Happiness begins where selfishness ends." "Ability will get you to the top, character will keep you there." "The team with the most talent usually wins." “Team spirit means you are willing to sacrifice personal considerations for the welfare of all. That defines a team player." "A person must be interested in finding the best way, not in having their own way." "Teamwork is not a preference, it is a requirement." "Loyalty is a cohesive force that forges individuals into a team." "Make sure team members know they are working with you, not for you." 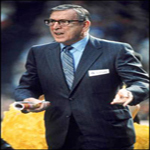 Coach John Wooden was one of the most organized men that you will ever meet. He was totally focused on his job and always stayed on track. He believed that planning and preparation and careful attention to the details are the keys to winning. "In 1948, I began coaching basketball at UCLA. Each hour of practice we worked very hard. Each day we worked very hard. Each week we worked very hard. Each season we worked very hard. Four fourteen years we worked very hard and didn't win a national championship. However, a national championship was won in the fifteenth year. Another in the sixteenth. And eight more in the following ten years." "Perfection is impossibility but striving for perfection is not. Do the best you can. That is what counts." "Winning games, titles and championships isn't all it's cracked up to be, but getting there, the journey, is a lot more than it's cracked up to be." "As much as I value experience, and I value it greatly, I'd rather have a lot of skill (speed & quickness) and little experience than a lot of experience and little skill." In conclusion, there has never been a finer man and basketball coach than coach John Wooden. His life, work, and good thinking are what all basketball coaches should study and try to use as a role model... RIP Coach John Wooden; what a blessing! One of the major jobs of a head coach is to get his players thinking “Team First.” All great teams have players who know and willingly try to fulfill their rolls on the team... John Wooden was a master at team building.